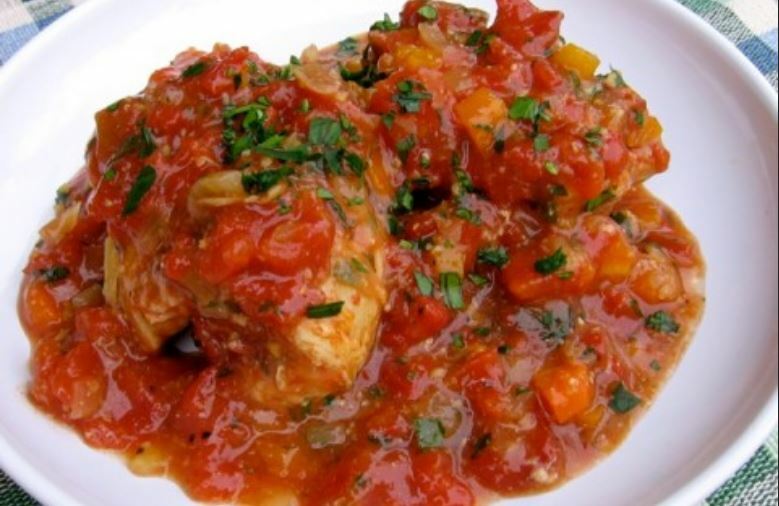 In a 5- or 6-quart slow cooker, combine the tomatoes, chicken broth, carrot, celery, onion, parsley, 1 teaspoon garlic, salt and pepper. Snuggle the chicken thighs into the vegetable mixture. Cover and cook on LOW for 4 to 6 hours or until the chicken and vegetables are tender. With a slotted spoon, transfer the chicken thighs to a serving dish. Discard the parsley sprigs. With a slotted spoon, transfer the vegetables to a bowl. In a small bowl, mix together the remaining teaspoon of garlic, lemon zest and chopped parsley. Stir half the parsley mixture into the vegetables. Top the chicken with the vegetables and remaining parsley mixture and serve.